When did you start playing tennis and how did you know you wanted to make a career out of it? Sierra: We started playing tennis when we were two and three but obviously we don’t remember that time too much. We started playing competitively when we were about 7 and 8. I believe that I knew that I wanted to make a career out of tennis when I couldn’t imagine a life without it. You get to a point when tennis has become apart of your soul and stopping would be giving up on something that you’ve been working your whole life towards. I’m not sure exactly when that realization happened but I wasn’t completely sure about that goal until about college. We just wanted to prove to everyone that we would fight until we couldn’t anymore or make it to the top. 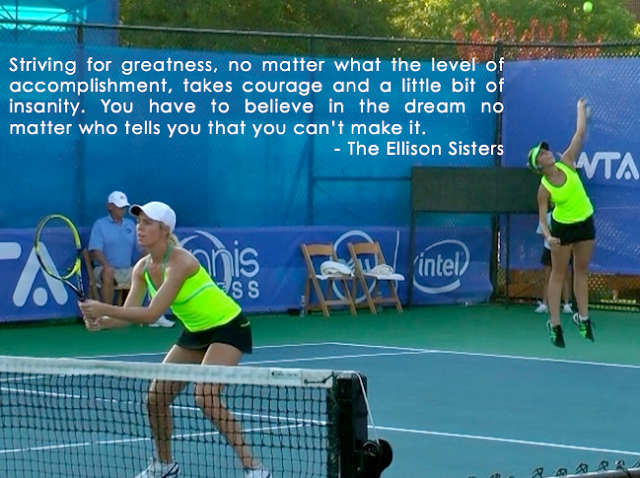 Do you think that being sisters gives you an advantage or disadvantage to other doubles teams? Sierra: Definitely an advantage. It took us a lot of hard work to function like the well-oiled machine that we have become but it is totally worth it. So many professional athletes have to travel alone, find a new doubles partner every time they play a tournament and get really lonely while on the road. We are lucky to have each other. We get to be a team in a solitary sport and that thought is comforting and empowering. On the court, we know each other. I know when she will cross or when she will run back and get a lob and she knows what serve I’m going to hit. This timing and flow comes with years of playing and struggling with each other. I wouldn’t change playing with my sister for anyone. Sorry Serena! Roxy: We play tennis 6 days a week for 2-4 hours per day. We go to the gym 3 days per week. And run/sprint work 2-3 days per week. And take a yoga class 2-3 days per week. How does diet affect your abilities on the court? Roxy: Last July, I was struggling to keep my energy up throughout the day. It got to the point where it was affecting my workout schedule. With some counsel from our trainer, I made the choice to go gluten free and dairy free. The first 10 days were terrible! I was craving foods that I would NEVER allow myself to eat (cupcakes, icing, candy). But as soon as I got through it, I started to notice a new surge of energy. This translated extremely well on the court. A month into the process, we won our first Pro-Circuit Tournament. Favorite snack or quick healthy recipe? Roxy: Sierra and I have this before every match. What would you say to someone who wanted to follow in your footsteps? Sierra: I would say to anyone who wanted to follow in our footsteps that it's an adventure. A crazy, intense, grueling, tough adventure that is one of the most rewarding expeditions I have ever taken in my life. Striving for greatness, no matter what the level of accomplishment takes courage and a little bit of insanity. You have to believe in the dream no matter who tells you that you can’t make it. I promise you that people will try to get in the way, try and tear you down, but I also promise that if you stay true to the path and to who you are, you WILL succeed. I look back at my own footsteps and wonder sometimes if I would do it again, and after a moment’s pause, the answer is yes. Do you ever feel like quitting? What keeps you motivated? Sierra: Of course. There have been moments since we started this journey that both of us have wondered if all the hard work is really worth it. I think the worst time was a couple of months ago just before our first big win on the tour. We had been struggling for what felt like forever, never getting a break. We lost around five straight times in the first round of a tournament in the ten point tie-breaker in the third set. It was demoralizing. We were at the breaking point and didn’t know where to go from there. I remember a moment where Roxanne looked at me and saw on her face that she was done, but fortunately something inside me snapped back into place. I looked at her and said, “No.” I decided right then that I wasn’t going to let us end like this. We made a pact, and we weren’t going to let it break. We went home, started changing our game plan, working with some new people on and off the court. We pulled together, I was there for her, she was there for me. But most importantly, it was our family, friends, and boyfriends who encouraged us to get off our butts and back onto our feet. . The next time we went on the road, we won! Fight for your dreams, love the moment, and cherish the battle.